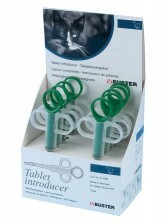 The Buster Pet Tablet Introducer Syringe has finger rings for better control when giving a tablet or capsule. The jaws that hold the tablet / capsule reduces the chance of injury. 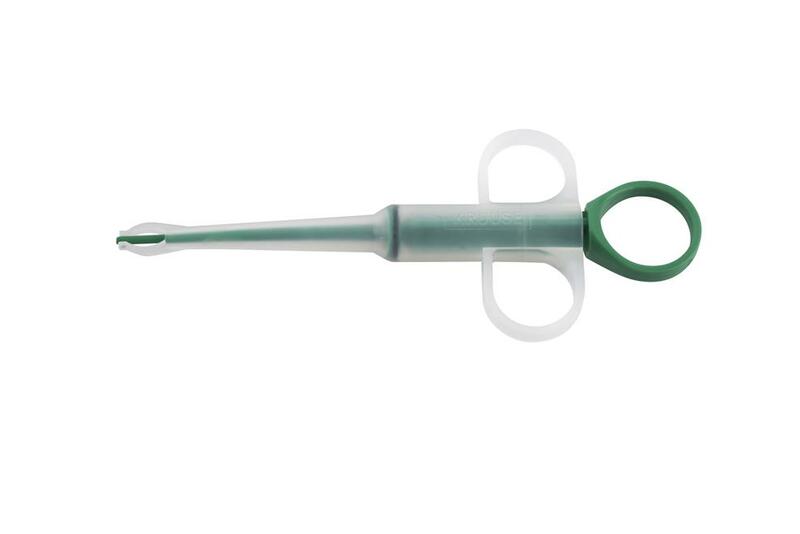 Water can be drawn into the syringe. When giving the medication, the water will aid and encourage swallowing. The Buster Tablet Introducer is especially useful in giving oral medications to cats and difficult to pill dogs. Do Away with the days of being scratched and clawed by your Cat! Do Away with the days when your dog or cat spit out the pill you've spent ages trying to get in to them! A must-have item for medicating cats! I've been using these for a couple of years now to medicate one of our cats. It's not too long (like other "pill shooters" I've used). Even someone with small hands can easily operate it. This is a must-have item. My cats aren't fooled by putting pills in food or other tricks. You have to use a pill introducer. These things do wear out...so if you've been using the same one every day for months and you notice that it's getting more difficult to move the green portion, go ahead and replace it. I had been using one of these every day for over 18 months...and couldn't believe the difference when we finally replaced it. The new one was much smoother and easier to use! I can't find these for sale in the US, so I buy them here and the shipping is amazingly fast! Click the button below to add the Buster Dog Cat Capsule Tablet Pill Pet Introducer to your wish list.